An official of the Nigerian Police Force identified as Julius Adewale Adedeji, who is said to have never taken a bribe before, has been celebrated by BBC as Nigeria’s 'most dedicated police officer'. While speaking in an interview following the recognition by the international media organization, he said; "I was just performing my duty. I didn’t know I was being watched. I thank God that it’s recognized and I feel like putting my best more and more. "A copy of the letter was delivered to my office for my information, when I read through it, I was wondering could it be true? 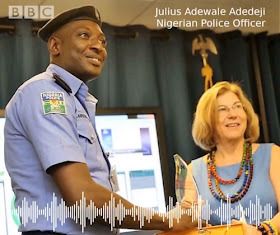 I read through the letter and I saw that it said, they wanted an institution where they can name and shame those that are not doing well and encourage the people that are doing well within the Nigerian police force, I felt so great." When as asked if he has been offered money before, he said; "Absolutely. And even today a person offered to give me some money and I said 'no, no, no, no why would you do that, I’m just doing my work'. They were surprised." When asked if he's not tempted to take bribe as synonymous with many policemen around the country, he said; "Of course, there’s no way one would not once in a while be tempted, but I just want to do what is right." On his colleagues in the Police force who are in the habit of taking bribes, he said; "Of course, there are bad eggs everywhere in every profession you can find, but there are quite a large number of people that are actually doing well within the Nigerian police force. "And I know in my little space where I work, I’ve seen people who are going the wrong way. We’ve talked to them and told them you don’t have to do this and God will find a way to bless you when you’re doing what is right."